Assemble your Avengers missions with the S.H.I.E.L.D. battle gear and super-powers of your Sky Attack Falcon figure! 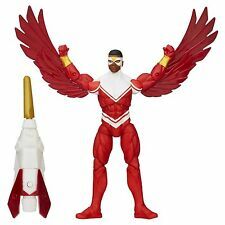 This winged superhero figure comes with a shoulder-mounted launcher that fires a missile at the enemies of justice! This is a Marvel Captain America Figure made by the good people over at Schleich. Schleich is well known for creating high quality, finely detailed, collectible figures. This figure is roughly 5.5 inches tall and looks great. Awesome figure for any Marvel fan! 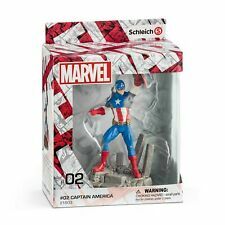 Recommended Age: 3 Condition: Brand New Dimensions: 5.5" X Schleich Marvel Captain America Figure. This is a Stone Monster Eldrador Creatures Fantasy Figure by the good people over at Schleich. Schleich are well known for doing high quality finely detailed figures. This figure is roughly 4.25 inches tall and 9 inches wide. Awesome figure for any fan of fantasy creatures! Recommended Age: 3 Condition: Brand New Dimensions: 4.25' x 9' X 1 Schleich Stone Monster Eldrador Creatures Fantasy Figure. Marvel Super Hero Mashers FALCON action figure! These Marvel Super Hero Mashers are exploding with fun! Falcon "Wave 14". This is very important! I will do the rest for you. Marvel's Avengers Infinity War Falcon figure from 2017. Includes an Infinity Stone. Hero Vision compatible. Sealed in original package. Upper package corner bent. These Super Heroes are ready to team up in combat to save the world! One of the most skilled aerial combatants in the world, Falcon soars into battle! Made by Hasbro. Made by Hasbro 2010. #4 - Prices are below competitors. 10 reasons to buy from Hurst-Jim. 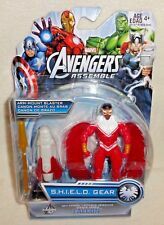 Marvel Avengers action figures: Falcon. Hasbro Playmation Disney. Condition is New. I ship USPS and shipping is calculated. I accept payment through PayPal. If you don't an unpaid item case will be opened. I will attempt to make things right. In good working condition. Item Condition. PLAYSKOOL SUPER HERO ADVENTURES. - I have been acomic fanboy for nearly 30 years. FALCON w/ Bird. MARVEL UNIVERSE. I am more then happy to work out any issues if there are any. No exceptions. Doing that is against the law. Playmation Marvel. Avengers Hawkeye Hero. banged up. see photos. 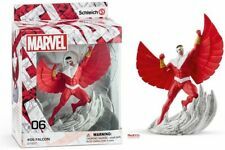 This is a Marvel Falcon Figure made by the good people over at Schleich. Schleich is well known for creating high quality, finely detailed, collectible figures. This figure is roughly 5.5 inches tall from base to top wingtip and looks great. Awesome figure for any Marvel fan! Recommended Age: 3 Condition: Brand New Dimensions: 5.5" X Schleich Marvel Falcon Figure. YOU WILL RECEIVE ONLY WHAT IS SHOWN IN PICTURE. THIS ITEM IS IN GOOD CONDITION, HAS NOT BEEN REMOVED FROM INNER PLASTIC (SEE PICTURES). Disney Infinity 2.0 TRU Exclusive Marvel Super Heroes Yondu Power Disc. If you don't an unpaid item case will be opened. I will attempt to make things right. In good working condition. Item Condition. Up for purchase are the two figures shown. Series 8 superior spider man and series 6 falcon. Both were only opened to verify identity and are still in their plastic holders. Original packaging and cards are included. YOU WILL RECIEVE WHAT IS SHOWN IN PICTURE ONLY. ITEM IS IN GOOD CONDITION AND HAS NOT BEEN REMOVED FROM INNER PLASTIC(SEE PICTURES). Originally made in 2014 by Schleich.This toy is a collectible toy for adults or is great for children ages 3 and up. Made by Schleich. Item Number: AA88 See photos for condition. GREAT TO ADD TO YOUR MARVEL UNIVERSE OR MARVEL LEGENDS SHOWDOWN COLLECTION OR AS A GIFT ! ITEM IS MINT !